North Korea claimed the missile was to carry a satellite into space, but it could be a missile with a warhead attached. Regardless of whether the purpose was to launch a satellite or a nuclear warhead -- it's the same technology. "Stage one of the missile fell into the Sea of Japan. The remaining stages along with the payload itself landed in the Pacific Ocean," according to a statement from NORAD and the Northern Command, read by White House Press Secretary Robert Gibbs. "No object entered orbit and no debris fell on Japan," the statement added. "NORAD and (the Northern Command) assesses the launch vehicle as not a threat to North America or Hawaii and took no action in response to this launch." The missile launch did succeed in what may have mattered most -- demonstrating that North Korea had the ability to launch a multistage rocket that could travel thousands of miles. 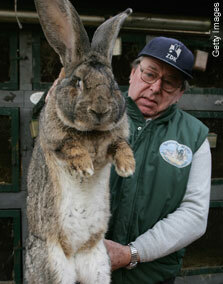 North Korea's wacko dictator Kim Jong Il plans to end his nation's starvation by breeding gigantic rabbits. My nearly 17-year-old daughter didn't understand Why the giant bunnies would cause the former president nightmares. 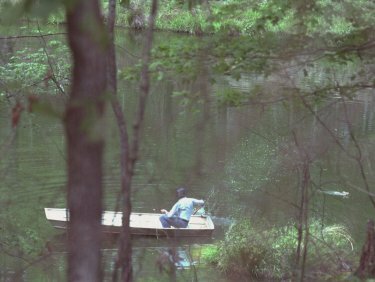 So I explained that on April 20, 1979, President Jimmy Carter escaped the White House and went fishing in a canoe on a pond in his hometown of Plains, Georgia. Carter was at first said to have fought off the attacking bunny with one of his canoe paddles. He later changed the story, so as not to offend animal rights activists, to state that he used the paddle to "splash water" at the rabbit and frighten it off. The rabbit is said to have made for shore after its "splash fight" with the president. My daughter's reaction - "That's so embarrassing." The officials said one military option calls for teams of Navy SEALs or other special operations commandos to conduct covert raids on Yongbyon's plutonium-reprocessing facility. The commandos would blow up the facility to prevent further reprocessing of the spent fuel rods, which provides the material for developing nuclear weapons. A second option calls for strikes by precision-guided Tomahawk missiles on the reprocessing plant from submarines or ships. The plan calls for simultaneous strikes from various sides to minimize any radioactive particles being carried away in the air. Planners estimate that six Tomahawks could destroy the reprocessing plant and that it would take five to 10 years to rebuild. Another set of targets could be the nuclear test site near Kilchu, in northeastern North Korea. That site includes several research and testing-control facilities in the mountains -- and possibly one more tunnel where a nuclear device could be set off, the officials said. The planning does not mean that an attack is imminent, only that the military forces are ready. Gertz also reports the Bush administration recently affirmed its commitment to both South Korea and Japan that it would use U.S. nuclear weapons to deter North Korea. The intelligence agencies’ finding that the weapon was based on plutonium strongly suggested that the country’s second path to a nuclear bomb — one using uranium — was not yet ready. The uranium program is based on enrichment equipment and know-how purchased from Pakistan’s former nuclear chief. The Times notes that the fact that the North Korea test used plutonium may revive the finger-pointing about whether Bill Clinton or President Bush is more responsible for the Korean test. The Times is wrong of course. The fact that the test used plutonium is proof that most of the credit goes to the failed Albright/Clinton unverifiable Agreed Framework. Under that deal, In return for North Korea's promise to comply with all international nuclear non-proliferation agreements and eventually and dispose of all spent nuclear fuel already produced, the U.S. agreed replace North Korea's graphite-moderated reactors with light-water reactors to supply N. Korea with up to 500,000 tons of heavy oil for heating and electricity production annually, until the reactors had been replaced. The Albright/Clinton regime disregarded the very important maxim articulated by President Reagan, trust, but verify. North Korea took advantage of the Clinton administration's trust and cheated on the Agreed Framework. Secretary of State Colin Powell, appearing October 20, 2002 on NBC's "Meet the Press" stated, "When we told North Korea that we knew what they were doing, they came back the next day, admitted it, blamed us for their actions and then said they considered that agreement nullified." At long last, the truth has come out. North Korea has admitted that the Agreed Framework negotiated by the Clinton Administration is a falsehood. The bottom line is that North Korea was out of compliance with its international obligations in 1994 when the Agreed Framework was signed; it remained out of compliance throughout the implementation of the Framework; and it is today out of compliance with its international obligations. 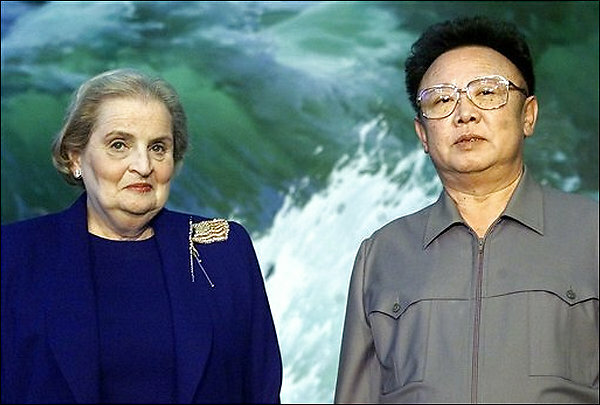 Clintonistas rushed to defend the failed Agreed Framework after the North Korean test. During the two terms of the Clinton administration, there were no nuclear weapons tests by North Korea, no new plutonium production, and no new nuclear weapons developed in Pyongyang. Through our policy of effective constructive engagement, the world was safer. Democrats, and the main stream media, continue to argue that the Bush administration failed on North Korea because it did not talk directly one on one with the North Koreans. This is also a falsehood. Secretary of State Condoleezza Rice has recently explained that the administration has talked to the North Korean one on one, a fact that was even reported by the main stream media back in May 2005. As I have written before, Diplomatic efforts with North Korea have never resulted in satisfactory results. Consider this time line, prepared by the Arms Control Association, summarizing the efforts to end North Korea’s nuclear and missile programs between 1985 and 2003. Regardless of North Korea's provocations, no penalty that North Korea considers meaningful is imposed upon the renegade state. North Korea will continue to do whatever it wants until the unthinkable happens. The U.N. Security Council voted unanimously on Saturday to impose financial and arms sanctions on North Korea in response to the rogue nation's nuclear test on Monday. Successfully shepherding the resolution sanctioning North Korea through the Security Council was no small accomplishment, and for good efforts Ambassador Bolton deserves a hearty thank you. Unfortunately, the Security Council's resolution will not induce North Korea to give up its nuclear weapons program nor its missile program. The North Korean government has demonstrated time and again that it will lie, cheat and ignore the will of the world to further its goal of developing nuclear weapons it can deliver with ballistic missiles. The only thing that can force North Korea to give up its defiance of the world is Chinese pressure. North Korea is dependent upon China for food and fuel. Only by China withholding those items supplied by China and necessary for the survival of the North Korean state will North Korea be forced to give up its missile and nuclear weapons programs. We should step up the efforts of the U.S.-led Proliferation Security Initiative. The program developed by John Bolton, which encourages countries to interdict weapons from North Korea, and other states of concern. Every ship going to and leaving North Korea should be stopped and searched to ensure contraband is not being transported to or from North Korea. We should also take page from the Cuban missile crisis play book. It should be U.S. policy that any nuclear missile launched from North Korea against the U.S. or any of our allies will result in a full retaliatory response upon North Korea. CNN reports the initial air sampling over North Korea shows no indication of radioactive debris from North Korea claimed nuclear test. CNN quotes an official as saying, "there isn't information to allow confirmation it was a nuclear test." This is not proof the North Korean event was not a nuclear test, only that it cannot be confirmed with the available information. UPDATE: CNN, the Associated Press, the BBC, the Guardian now report preliminary analysis of air samples from North Korea contain radioactive debris consistent with a nuclear test.